ORDER at Patricia’s BigCartel page! Hammond has done her research well and has assembled a very wide variety of tunes, from anguished laments to peppy marching songs and beyond. 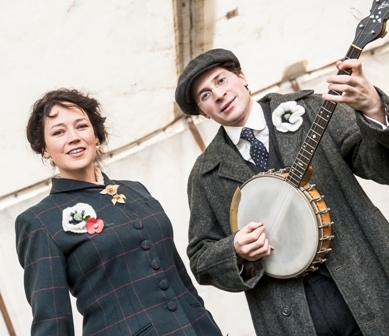 She has even tapped the overlooked genre of German war songs (Gegen England and Bald, Allzubalde) and included a French drinking song (Quand Madelon). Even though her crystal-clear mezzo-soprano voice was probably trained for salon pieces or light opera, her inherent love for these long-forgotten moments in our musical history brings them alive again, whether she is enthusiastically urging us to march forward or mourning a resultant tragedy. Special note should be made of her musical accompaniment, with period-influenced arrangements by Matt Redman that capture the mood of each song perfectly. The lyrics, which are easily heard, even remind the listener how the English lexicon has changed in the last 100 years. The sound quality is extremely good and the liner notes are extensive and enlightening. Here’s a digest of the thing for you to hear! 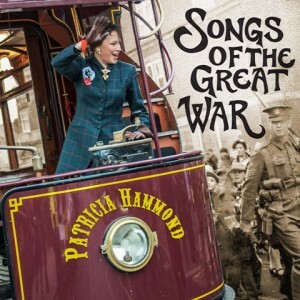 Any chance of getting details of the personnel on the Great War recording that I’ve just bought on mp3? Certainly! I’ll send you the booklet notes. It’s such a detailed recording with different groupings for each track, and thus would have been a pain to put on CD Baby. To be honest, digital sales are so miniscule in monetary scale that it just wasn’t worth the immense time it would have cost! Habe Patricia bei der Gedenkfeier am 1. Juli in Fricourt auf dem deutschen Friedhof mit ihrem Liedvortrag ( Bald ach so balde ) gehört. War sehr ergreifend und für mich und meine Freunde unvergesslich. Bedanke mich nochmals für diesen Beitrag.